Beginning on Easter Sunday, March 23, 1913, torrential rains across the Midwest dropped a record three months of rainfall in four days. Floodwaters funneled down Ohio's Miami Valley into the heart of the vibrant industrial city of Dayton. Levees burst, houses were swept away, and downtown was gutted by fires blazing from broken gas mains. At the end of Easter week, nearly 100 Daytonians had perished, and tens of thousands more were left homeless and destitute—a tragedy that made banner headlines in newspapers nationwide. Out of Dayton's ashes and mud rose fierce public resolve never again to suffer such destruction. 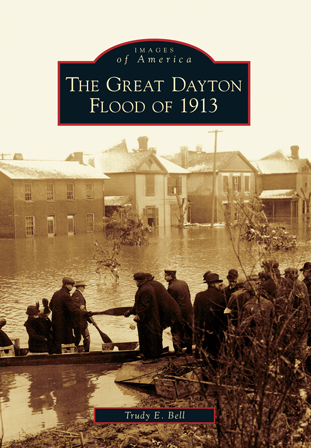 The Great Dayton Flood of 1913 reproduces some 200 astounding photographs from the collections of the Dayton Metro Library and the Miami Conservancy District and the archives of the National Cash Register Company at Dayton History. They portray the terrifying flood, monumental destruction, heroic rescues, and compassionate leadership that occurred during the disaster and its immediate aftermath, as well as the pioneering flood-control engineering that has kept Dayton safe ever since. Trudy E. Bell is a science journalist and independent scholar with a master's degree from New York University in history of science and American intellectual history. She has written more than a dozen books and 400 articles about science, engineering, exploration, and history. Since 2003, she has visited archives in 15 states researching the 1913 storm system, flood, and consequences.